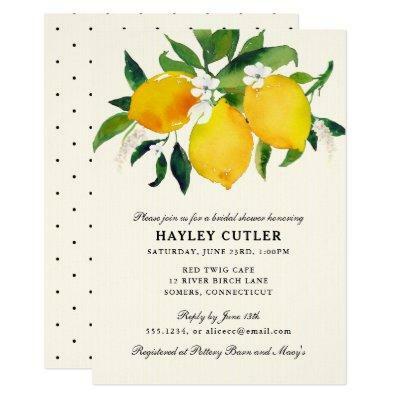 A great invitation for a bridal shower featuring watercolor painted yellow lemons and green leaves, accented with dainty white flowers. The background is a very light yellow striped design. A simple black dotted design highlights the back of the card. Use the template form to add your custom text. The "customize further" feature can be used to access the advanced font, color and layout menus.